After finally managed to visit Durham’s Flat White after many years of trying, I found myself in the City of London last week, walking past another stalwart of Britain’s speciality coffee scene, Alchemy. A roastery (based in Wimbledon) with a single coffee shop in the narrow lanes south and west of St Paul’s Cathedral, Alchemy just pre-dates the Coffee Spot. It’s another of those places that I’ve been aware of for as long as I’ve been doing the Coffee Spot, having wandered past on several occasions, thinking that I must go in. Sadly, the timing has never been right. So when I wandered past last Thursday, in I went. The Alchemy Café occupies a bright, square space on the corner of Ludgate Broadway and Carter Lane. It’s an area that is now well-served by speciality coffee shops, but Alchemy’s one of the stalwarts, having first opened its doors in 2013. As nice as the space is, the real draw is the coffee, with two options on espresso, plus a single-origin on pour-over and another on batch-brew. There’s also cold brew, various teas plus a selection of cake and savouries, while Alchemy’s complete range of beans is available in retail bags. I’ve always enjoyed wandering the narrow, traffic-free streets and lanes of the City of London, with its quiet, unexpected courtyards, surprising, contrasting views (turn one corner and there’s St Paul’s, turn another, the Shard), hidden churches and, these days, speciality coffee shops. The Alchemy Café is one such find. Although Alchemy’s coffee, which comes from an industrial unit in south Wimbledon, is available in a variety of coffee shops and other outlets throughout the capital, with the odd destination further afield, this is its one-and-only coffee shop and, according to the staff, likely to stay that way. Alchemy occupies square floor-plan right on a corner, with the door on Ludgate Broadway, which we’ll call the front. There are two windows to the left of the door, while on the right-hand side, running along Carter Lane, there are three, the first occupying a position equivalent to the door. Outside seating, in the form of a narrow bench, is tucked under the broader of the two windows on Ludgate Broadway, where the A-board cuts a solitary figure on the veritable expanse of pavement. Inside, a long window-bar spans the two windows to the door’s left, with six stools for seating. To the right, the first window is used for storage, while a slightly shorter window-bar spans the remaining two windows with room for five stools. The counter, a three-part affair, occupies the back and left-hand walls, with the space between it and the door left free for takeaway customers, who make up a large proportion of the customers. The counter starts against the back wall, facing the door. The first part holds the cakes and till, menu on the wall behind. The middle section is at 90⁰ to this, running parallel to the left-hand wall and facing the right-hand wall. Containing the three-group La Marzocco Linea espresso machine and two Mythos 1 grinders, it’s the heart of the operation. The final section is parallel with the back wall, facing the window-bar. This contains the pour-over station, including an Uber boiler and EK43 grinder which against on the left-hand wall. 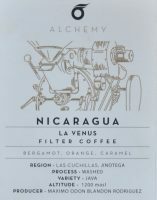 Alchemy is the process of changing up its coffee offerings. During my visit, two blends, Opus and Elixir, were on espresso, although going forward, I believe that the Opus (75% Brazil, 25% Colombia) with its notes of hazelnut, milk chocolate and caramel, will be the house-blend, the other slot being a regularly-rotating single-origin or blend. Meanwhile, there are always one/two single-origins on pour-over using the V60, with another on batch-brew. While I was there, the pour-over was a Nicaraguan, while the batch-brew was from the Democratic Republic of Congo. There was also cold-brew and a relatively new experiment, espresso soft-serve ice cream. Made using eight shots of the Elixir blend per batch, you can really taste the coffee! I had a little sample and really loved it. However, I’d come for lunch. As well as a range of cakes, Alchemy has a small selection of savouries, including sausage rolls, banana bread and my usual fall-back, toast, so I treated myself to a slice of sourdough toast with jam. Really tasty and crunchy, it was just what I needed to soak up the caffeine. I followed that by a shot of the Elixir as an espresso. A blend of 75% Rwandan and 25% Brazilian, it had tasting notes of pineapple, bittersweet chocolate and black cherry. Personally, I wouldn’t have said pineapple but I can see where it was coming from. There was a definite acidity to it, although not too sharp. While it’s not what I’d want every day, it made an interesting contrast. This entry was posted in Cafe/Roaster, Cake, Central London (East), Coffee & Beer, Coffee & Wine, Coffee Shops, Retailers and tagged Alchemy, include by Brian Williams. Bookmark the permalink.